THE FOUNTAIN OF YOUTH IS BETWEEN YOUR EARS. A healthy brain is the key to staying vibrant and alive for a long time, and in Use Your Brain to Change Your Age, best-selling author and brain expert Dr. Daniel G. Amen shares 10 simple steps to boost your brain to help you live longer, look younger, and dramatically decrease your risk for Alzheimer's disease. Over the last 20 years at Amen Clinics, Dr. Amen has performed more than 70,000 brain scans on patients from 90 different countries. His brain imaging work has taught him that our brains typically become less active with age and we become more vulnerable to memory problems and depression. Yet, one of the most exciting lessons he has learned is that with a little forethought and a brain-smart plan, you can slow, or even reverse, the aging process in the brain. By adopting the brain healthy strategies detailed in Use Your Brain to Change Your Age, you can outsmart your genes, put the brakes on aging, and even reverse the aging process. If you change your brain, you can change your life — and your age. With the Mind Health Report, you'll trek deeper into the inner workings of your brain than ever before. From more happiness and contentment in your relationships, to greater satisfaction in your work, better overall health, and a happier outlook on life in general . . .
You'll be privy to the latest advancements in brain research from the highest pinnacles of neuroscience and psychiatry. And not only will you read about breakthrough techniques for revitalizing and rejuvenating your brain health, you'll also get access to actual case studies straight from our vast collection. Feature Articles. This is where top experts will take you by the hand and give you practical techniques to help you improve and expand your brain function. Questions and Answers. Because this newsletter is for you, leading physicians will answer questions you have about your own brain health, what you've read about in the news relating to mind health topics, or other medical issues that concern you. Insights. Here, new findings in research help you boost your own brainpower, and ultimately your overall health. You'll find tips, tricks, and techniques to improve your brain capabilities simply and easily. We've made sure Dr. Gary Small's Mind Health Report is absolutely packed full of brain-enhancing information and strategies from renowned doctors and researchers to help you enjoy the happy, healthy, and contented life you deserve — regardless of your age. IMPORTANT NOTE: Sales tax included where applicable. Your trial subscription comes with convenient automatic renewal. At the end of your subscription, we'll notify you. If you want to keep the publication, do nothing and we'll renew your subscription using your credit/debit card on file. We'll charge you $39.95 (or $36.95 for digital) for one year (12 issues) of Dr. Gary Small's Mind Health Report and thereafter at the lowest rate then in effect. There is no risk, you can cancel within the first six months for a full refund of the unused portion of your subscription. 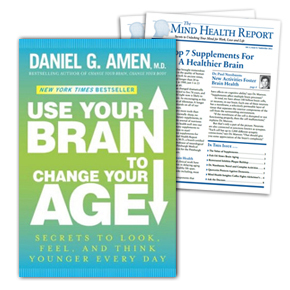 Dr. Daniel Amen shows you how to reverse the aging process with these brain-smart strategies.